Understanding the natural environment and future anthropogenic changes requires detailed information on key components of the Earth-atmosphere system. To this aim, satellites provide a powerful platform for global remote-sensing observations on a regular and long-term basis. 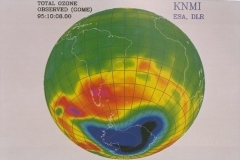 The ERS-2 and Envisat satellites carry the Global Ozone Monitoring Experiment (GOME) and the SCanning Imaging Absorption SpectroMeter for Atmospheric Cartography (SCIAMACHY), respectively, whose objectives are to measure a range of atmospheric trace constituents with the main interest on global ozone distribution. SSE Ozone 3D is a service designed to provide thematic maps of the Ozone distribution at the different layers of the atmosphere, through an inversion scheme based on neural networks. It is available in the European Space Agency's (ESA) Service Support Environment webportal SSE website. The service allows the user to search and select SCIAMACHY or GOME data from the ESA catalogue, that then are downloaded and processed on demand and made available via an FTP site for download. Additionally input parameters describe the desired pressure levels for which the output has to be produced. Ozone 3D service processing is fully automatic, the processing of data is done from the ESA GOME or SCIAMACHY collections. The Earth Observation Laboratory of Tor Vergata University, Rome, has developed a neural network technology able to provide ozone concentration 3D maps from the radiance measurements provided by the instruments GOME and SCIAMACHY. Such a technology drastically reduces the computational effort required by more traditional approaches based on Optimal Estimation methods. Moreover, after long validation campaigns involving intercomparisons with different other satellites and ground-based measurements, this technology seems now to have reached the maturity necessary for operational services.